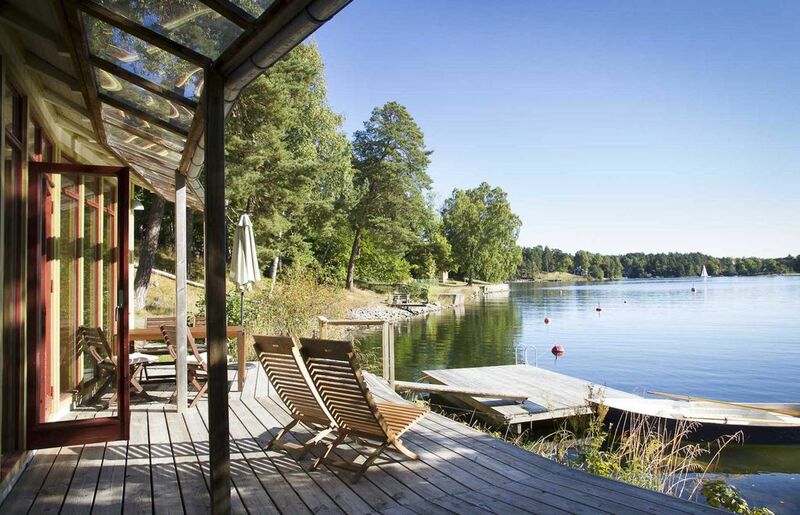 The house is built in 2005 on a large beachfront in a protected bay in the Stockholm archipelago, own water and jetty. The living space is a total of about 50 sqm with large glass window facing the veranda and the sea. The house has an open floor plan with combined kitchen and living room with couch (sofa), TV and large windows / door facing the veranda and a stunning water views and a fireplace. There is also a kitchen area with ceramic hob, oven, fridge and kettle. Adjacent to the living room is a bedroom with a double bed. The bathroom has a shower, toilet and sink. At the entrance to the site can park their car. Car recommended, otherwise 10 mins walk to the bus stop. 6 km to the nearest shopping center that includes a grocery and liquor store. An idyllic, relaxing, peaceful, beautiful retreat! My little family of 3 have rented many a holiday home over the years. Some have been good, some not so good and then, once in a while there is perfect. The Banana House falls into the final category. Right from the start the booking process and all of my constant questions were handled quickly and thoroughly by Susanne. We arrived late and the house was warm and welcoming. Everything we needed was there for us. We came to visit the many attractions of the city of Stockholm (which is in easy reach), but due to the comfort of the house and the beauty of the surroundings found ourselves constantly finding reasons to stay in! Just watching the different levels of light fall on the water could keep you busy, but there is also the added attraction of the local wildlife (we were fortunate enough to have a garden visit from a local deer and her young). So if you are thinking of booking, go ahead, you won't regret it. We are so happy you have enjoyed your stay and you are always welcome back! It has been a pleasure having you here! Leider war die Woche in der wir da war sehr verregnet, trotzdem hatten wir eine schöne Zeit. Mit dem Kamin und den Blick auf das Wasser war es super gemütlich. Haben uns sehr gut erholt. Gerne noch mal im Sommer! Wir verbrachten ein verlängertes Wochenende zu dritt im Haus. Wir hatten eine ruhige Unterkunft in schöner Natur in unmittelbarer Nähe von Stockholm gesucht. Anlaß war der Besuch Stockholms als Geschenk zum 80. Geburtstag unserer Mutter. In der Unterkunft hat von den Schlafmöglichkeiten bis zum Kamin alles gepasst. Die Ruhe war total und in dieser Weise fast einzigartig. Wir fanden das liebevoll eingerichtete Haus warm und sehr sauber vor. Alles funktionierte einwandfrei. Susanne unsere Gastgeberin zeigte uns persönlich den Weg zu Fähre, indem sie mit Ihrem Wagen unserem Mietwagen vorfuhr. Super Service! Fahrzeit ca. fünf Minuten; kostenfreies Parken direkt an der Fähre ohne Probleme. Die Fährverbindung nach Stockholm Zentrum nimmt ca. 25 Minuten in Anspruch und ist für sich schon ein beeindruckendes Erlebnis. Häuschen klein. Für 2 Personen optimal. Plus: Die Lage ist toll zwischen Stockholm und den Schären. Nett eingerichtet, wie auf den Bildern. Sauber. Minus: Bett fand ich unbequem. Preis vllt etwas teuer. Hatten schon grössere und ebenso schöne Häuser für geringere Miete. Ist eben Schären-Lage. Sehr zahme Enten, die aus der Hand fressen. Sind viel mit Waxholmboot gefahren. Anlegestelle in der Nähe. Am schönsten war die Insel Grinda. Wir haben unseren Urlaub genossen - es war so schön! Diese Ruhe, die traumhafte Aussicht, die schöne Terrasse, das Ruderboot, wahnsinnig gutes Wetter - es hat uns so begeistert, dass der Abschied uns sehr schwer gefallen ist. Und trotz der Idylle die Nähe zu Stockholm, problemlos mit der Fäher zu erreichen, also besser hätten wir es nicht treffen können. Wir danken Susanne und Bengt für die wunderschöne Zeit! This fine house is idyllically situated beautifully by the sea at a sheltered bay at the tip of a promontory, Björkudden, with its own jetty. Here you have everything you could wish for - nature, sea and tranquility, wildlife and bird life, and at the same time one of the most beautiful capitals conveniently located only 20 minutes drive into downtown Stockholm. Here at Björkudden can swim from your own jetty which is located directly next to the house, take the small boat around the headland further into Velamsunds nature reserve, where there is a small café and restaurant, and beautiful walks. There is also a swimming lake, horse riding, sea kayaking, horseback riding, jogging trails, walking paths, forests, meadows, and you can also get there by walking or cycling along a small road. From our dock you can easily get further out in the Stockholm archipelago with all its 30,000 islands and islets - by boat or by Vaxholm boat from nearby the rice brew. Stockholm's beautiful steamboats pass daily in the bay during the summer. It is as beautiful every season, every time has its charm. Summer swimming and boating, sun and heat, the autumn with all their colors, walks and mushroom picking, winter with skiing and skating and a warming fire in the stove, and in the spring with the budding greenery, sit and enjoy the spring sun in a lounge chair on the bridge and see on seabirds swim around with their newly hatched chicks. Only 18 km from Björkudden is Stockholm with everything our beautiful city offers of culture, entertainment, restaurants, museums, shopping, etc. Bus service to downtown Stockholm 1-2 / hour. Daily boat Vaxholm, Stockholm city center from the rice, bridge, 2 km away.